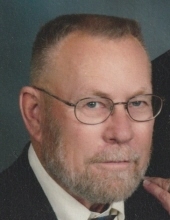 Funeral services for Gary Heuer, 76, Brookings, and formerly Aberdeen, are 1:00 pm, Monday, April 8, 2019 at Good Shepherd Lutheran Church, Pastors Liz Dieseth Pearl and Roger Noer officiating. Military honors by Sidney L. Smith American Legion Post 24. Burial at Riverside Memorial Park. Gary died Wednesday, April 3, at Neighborhoods of Brookview, Brookings. Visitation: 3:00-7:00 pm, Sunday, family present 5:00-7:00, prayer service 7:00 pm, at Spitzer-Miller Funeral Home. Gary was born on a farm southwest of Onida, SD on April 6, 1942 to Raymond and Odessa (Rieger) Heuer. He grew up in the Pierre area, earned his GED, and joined the Army. He married Helen Adam on August 8, 1964 in Tripp, SD and they spent most of their married life in Aberdeen. Gary worked for the American Automobile Association and Prudential Insurance Company as a salesman. During this time he made many lifelong friends and connections. Gary was most remembered as an outdoorsman. A hunter and fisherman, he was truly at home watching wildlife, learning how to live off the land, and working to understand how it all fit together. As a fisherman, he got to tell stories of the one that didn’t get away. He still holds records for both state and world record fish. He was a founding member of the Dacotah Territory Muzzle Loader Club. In addition to being an outdoorsman, Gary was a Master Gardener, enjoyed playing chess, wood carving, and flint knapping. In his younger days, it was not uncommon to see him out at a rendezvous in buckskin pants and cotton shirt, with his black powder musket by his side. He loved to share what he knew with those willing to listen. Grateful for having shared Gary’s life are his wife, Helen, daughter, Melanie (Steve) Timmerman, Brookings, their children, Samuel, Grace, Rachel, Luke, and Sarah; daughter, Melissa Heuer, Aberdeen, her children Mary and Anthony and his sons, Brayden and Noah; son, Jason (Amanda) Heuer, Marysville, WA, their sons, Bentley and Austin, sister, Doris St. John, Sioux Falls. Gary is preceded in death by his parents, brothers, Virgil, James and Gale. To send flowers or a remembrance gift to the family of Gary W. Heuer, please visit our Tribute Store. "Email Address" would like to share the life celebration of Gary W. Heuer. Click on the "link" to go to share a favorite memory or leave a condolence message for the family.